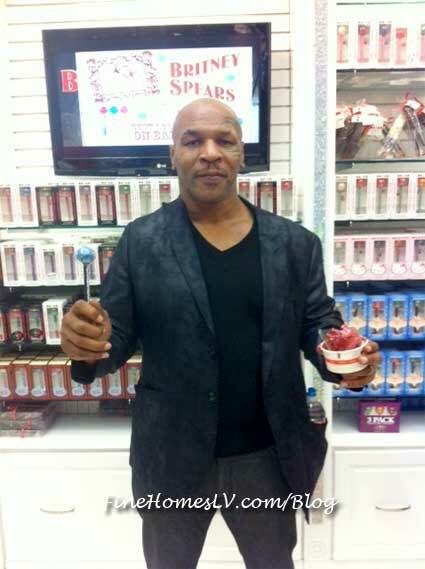 Boxing legend, Mike Tyson, satisfied his sweet tooth at Sugar Factory at Miracle Mile Shops inside Planet Hollywood during his evening on out Saturday night. Picking up his favorite Swedish Fish, along with sour apple gummies and a Couture Pop for his daughter, Tyson also walked out with two scoops of raspberry gelato. Tyson created a commotion in Sugar Factory Las Vegas as he took photos with fans and signed customers’ Couture Pops. One guest wanted a photo with the famed athlete so bad that he ran to a nearby store and purchased a $1500 camera to document the occasion.